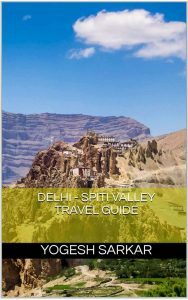 I love India, not only because I was born and raised here, but also for the sheer diversity of religions, languages, landscape and of course, food. Each region has its own specialties, with their unique flavors and ingredients. 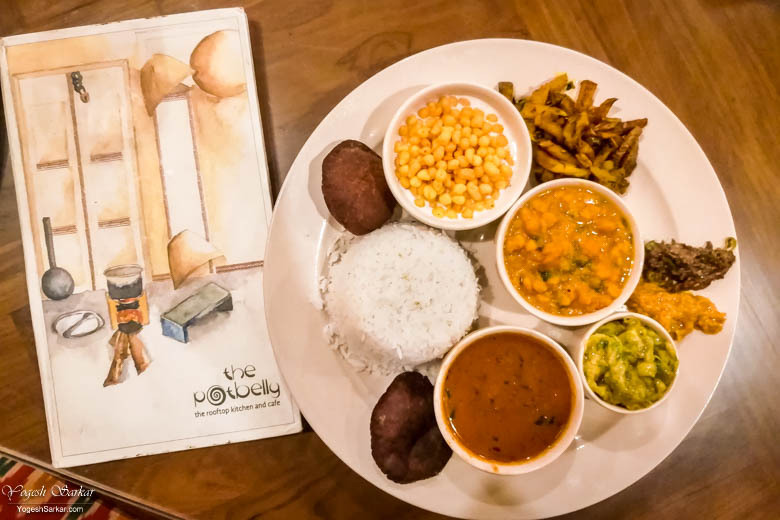 As far as Bihari Cuisine is concerned, my experience with it has been rather limited to Litti Chokha, until I visited The Potbelly, a Bihari Cuisine Restaurant. The Potbelly is located in Bihar Niwas in Chanakyapuri (if traveling from Ring Road side, take the left before Yashwant Palace and then another left after the BP Petrol Pump.) 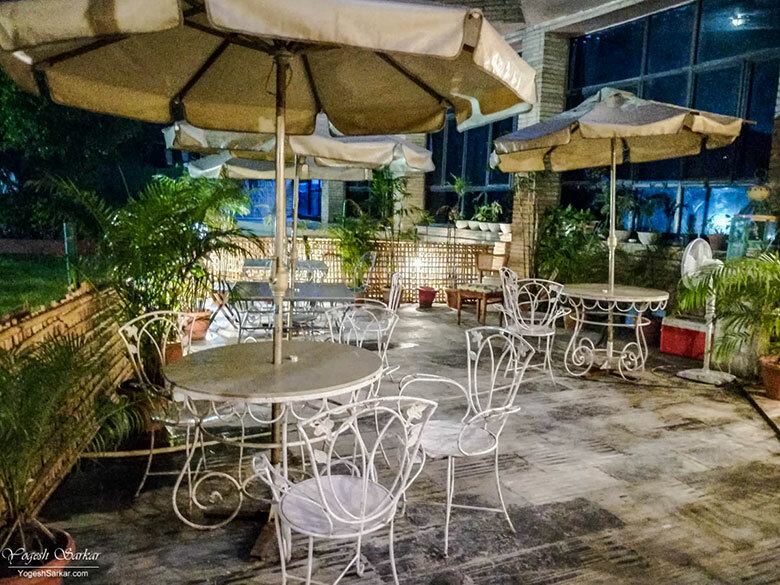 Since it is located inside the official guest house of Bihar, it is easy to miss and we had to call the restaurant to confirm their location (in case the sentry stops you, tell them you need to visit room 313.) There is parking available inside the Bihar Niwas. 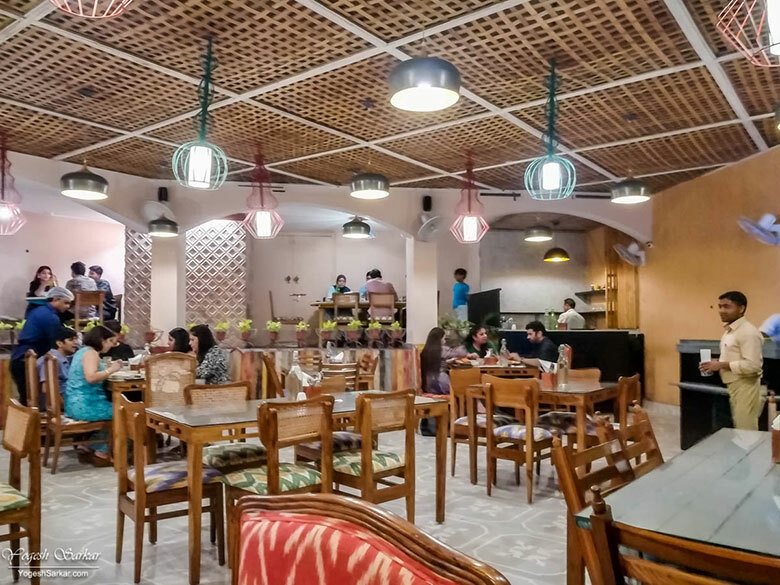 Walking in, The Potbelly looks good and contemporary, nothing really stands out, unless you plan on sitting outdoor, which is beautiful but too hot right now for Delhi’s weather. The service, for the most part, is quick, prompt and courteous. However, they seem a little confused, since, on a couple of occasions, they brought us someone else’s order. 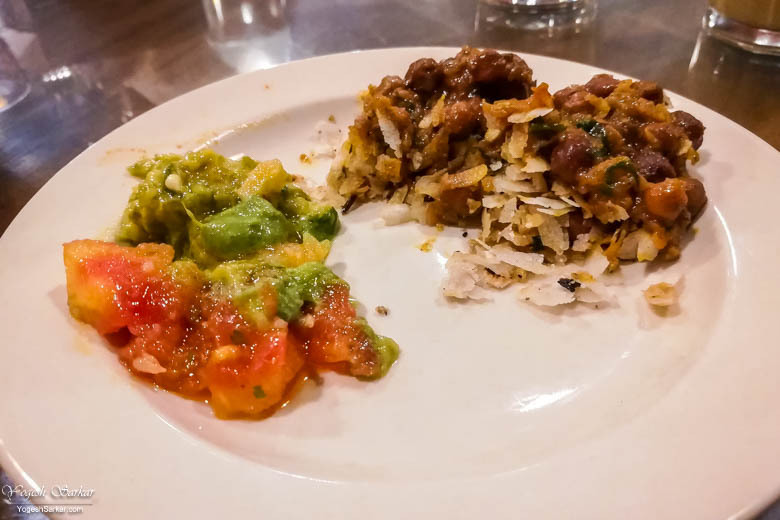 As far as food is concerned, there are a plethora of options for vegetarians and non-vegetarians. We decided to order Sattu Cooler (sweet), Mirchi Masala Lemonade, Ghoogni Churra, Litti Chokha, Dal Bhat Thali and Sweet Boondi on Hung Curd (dessert). Sattu Cooler had a distinct flavor of sattu and was mildly sweet, but I didn’t like it. Mirchi Masala Lemonade, on the other hand, was salty and spicy in just the right way to add a lot of flavor and punch. It felt refreshing, though it might not be your choice of poison if you don’t like a lot of masala in your drinks. 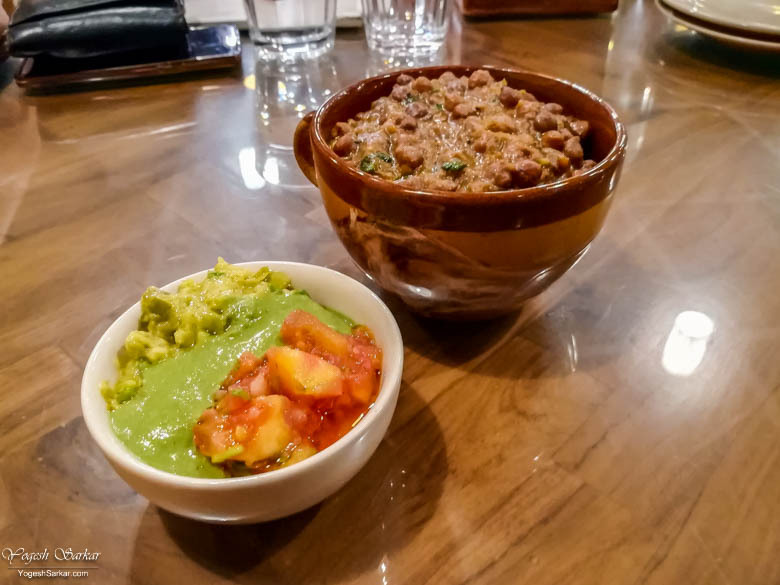 Ghoogni Churra is made of kala chana (black chickpeas) mixed with lightly fried poha/chura (flattened rice) and that results in a dish that is both soft and crisp at the same time. It was served along with yam pickle and parwal chokha. I found it to be delicious and different from the usual starters, though the yam pickle had a lot of mustard oil. 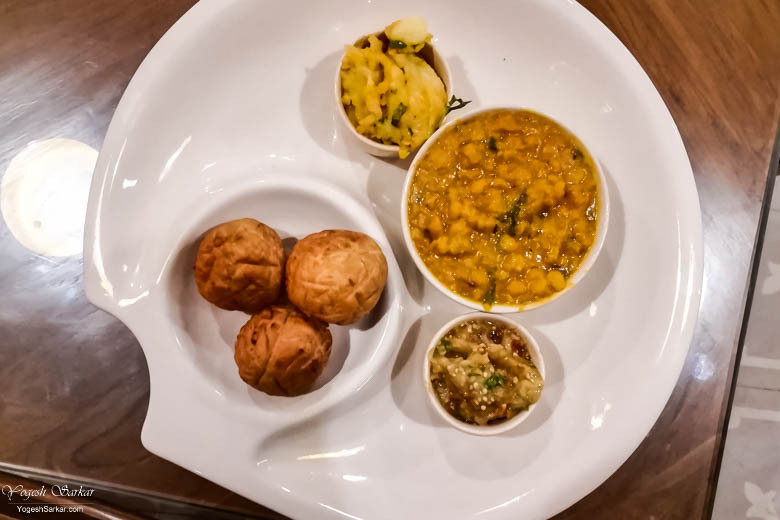 Litti Chokha was served with chana dal, eggplant chokha, and mashed potatoes. Though the dal was bland, the aubergine chokha was finger licking good and provided just the right flavor with the litti. Mashed potatoes also had good taste, but what really stood out was the chokha and I felt, it was served in small quantity. Dal Bhat Thali turned out to be quite an extensive and interesting affair since apart from rice and chana dal, it was served along with marua (finger millet) pooris, aloo bhujiya, ramsalan (besan sabzi, sort of like gatte ki sabzi), parwal chokha, boondi raita, and pickles. The only complaint I have about the Dal Bhat Thali is the fact that pooris were extremely small and to make matter worse, they were delicious, so they left us wanting more! Dal was once again bland and mostly ignored by us, while ramsalan was alright and so was boondi raita, though it had too much boondi. Parwal Chokha was finger licking good and aloo bhujiya was so good, Mansi and I fought over it. Aloo bhujiya had a good amount of masala and just about enough sour taste to make you want more of it! 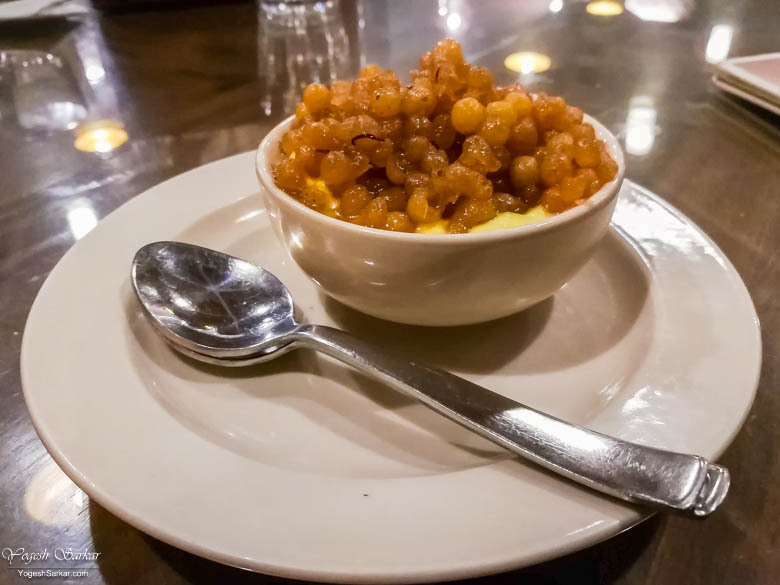 We decided to order Sweet Boondi on Hung Curd as dessert, even though we were full to the brim.However, we were disappointed, since the boondi was excessively sweet, the curd was too sour and overpowered other flavours. This was the only dish that disappointed us, though Mansi didn’t like Ghoogni Churra either. Our bill for the entire meal (Sattu Cooler, Mirchi Masala Lemonade, Ghoogni Churra, Litti Chokha, Dal Bhat Thali and Sweet Boondi on Hung Curd) came out to be Rs. 1,305, inclusive of GST and 10% service charge. Even though it seems a little expensive, but given the quantity and taste, I feel it was worth it. Especially since we could have easily skipped the starter or one of the main courses and still would have been satiated. 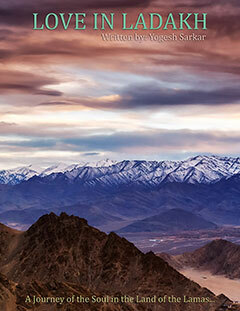 A big thanks to Mansi for finding this place and convincing me to go here. 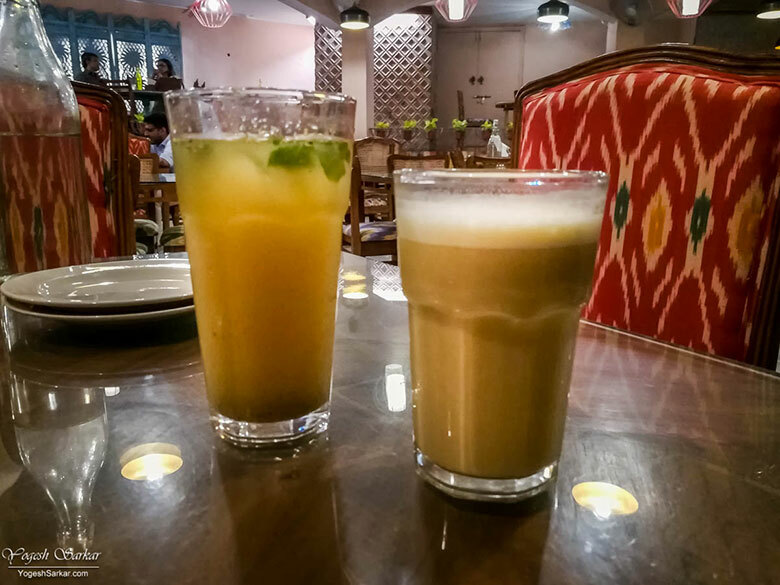 The Potbelly also has a restaurant in Shahpur Jat and another in Gurgaon.